A TRANSFORMATION is currently underway within primary care in Dumfries and Galloway – as a result of a new national contract for GPs. Paramedics, pharmacists and mental health nurses are among the first clinical professionals to take on new responsibilities in the region as part of a three-year programme to implement the General Medical Services (GMS) contract developed by the Scottish Government and the British Medical Association and agreed in January 2018. Deputy Medical Director for the Health and Social Care Partnership Dr Grecy Bell said: “We have just three years in which to implement a contract which moves responsibilities for delivering services such as blood tests, repeat prescriptions and dealing with minor ailments to Dumfries and Galloway Health and Social Care Partnership. “To this end, the Transforming Primary Care Programme Board have identified priority areas where initial work is required. Clinical Pharmacists were already taking on increased roles within GP practices, and that is now being further developed as they meet patients and provide expert consultation around medications. Paramedics are starting to play a key role in providing home visiting support for some GP practices, with a six month trial currently underway in the Machars. Meanwhile, mental health nurses are now set to become a regular feature in GP practices, delivering support and serving as a means of early help and intervention for people directly. Dr Bell said: “Three years may seem like a long time, but the scale of transformation resulting from the new contract for GPs is really significant. “We’re confident that we’ve identified the areas where we can begin making changes which will allow GPs more time to focus on working with patients and their communities, and which will result in the largest immediate impact. “However, we are conscious that there is still a great deal to be accomplished by April 2021, against the backdrop of a region with an ageing population spread across a rural landscape and with limited resources in terms of finance and staffing. Videos focusing on work in Dumfries and Galloway involving the clinical pharmacists, paramedics and mental health nurses are now being featured on the DGNHS YouTube channel and on social media. Hannah Brawley is a Clinical Pharmacist working across three GP practice surgeries in Annandale and Eskdale. Explaining what the changes mean, Hannah said: “It allows us to take on more responsibilities and take on support within the practices which previously would have remained with the doctors. “It allows patients to speak to somebody more specialised in a certain area. If it’s more of a medication query, it allows us to do more in-depth reviews with the patients. Hannah believes that patients will see the benefit of being able to speak with a professional whose area of expertise is medication. She said: “As patients see pharmacists in the surgery more, we’re really hoping that patients can see the benefits of the range of services that pharmacists can offer in GP practices. “Recruitment for pharmacists within GP practices is already throughout Dumfries and Galloway; previously there weren’t many pharmacists within surgeries, so this recruitment is a really positive development. “The new GP contract allows the role of the pharmacist to develop and take on additional responsibilities in different practices. Another exciting aspect will be working with other health professionals within a GP practice with the aim of providing a better service for our patients. Hannah says that the new model is being well received by both patients and GP practices. 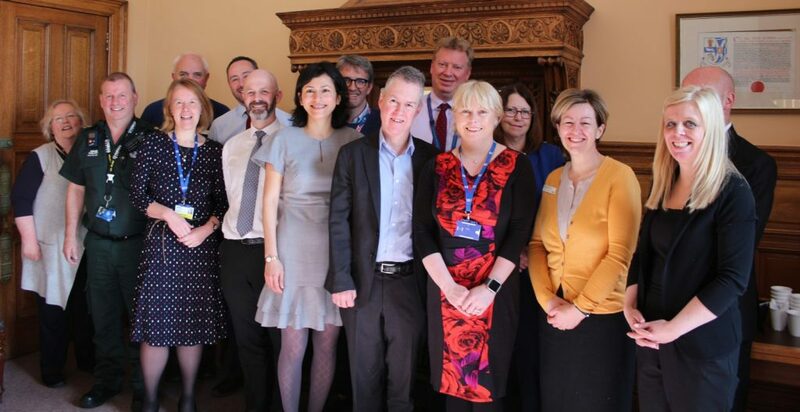 The three-year programme to transform primary care in Dumfries and Galloway is building on established work around mental health nursing within the community. Justina Ritchie is Service Manager for Community Mental Health Nursing, and she said: “Over the last 18 months, there’s been a pilot running in two practices in the Stewartry and two practices in Wigtownshire where we’ve had community mental health nurses based in primary care centres working alongside GPs, providing early assessment and interventions to people with mild to moderate mental health issues. In order to support this roll-out, two posts have now been filled for Annandale and Eskdale and Dumfries and Nithsdale, and recruitment is currently underway to fill five posts for the Wigtownshire and Stewartry localities. The intention is to deliver the new approach within every GP practice within Dumfries and Galloway by April 2021 and that it will come in addition to the community mental health teams which already exist. Justine says that there is a recognised need to provide a service to those whose needs are not severe or complex in nature but would benefit from a specialised service based within the GP practice. She said: “Hopefully the people who will be seen through primary care mental health will have quicker access to mental health specialists and get access to interventions that’ll help them self-manage their mental health difficulties so they probably won’t need to move on to secondary mental health services. And she added: “The initial response has been very positive, from both the patients and from GPs alike who have had involvement in pilot. A six-month project is underway in Wigtownshire, embedding paramedics in GP practices in the Machars. Three paramedics are working with the Galloway Hills Medical Group in Newton Stewart and the Southern Machars Practice around Whithorn and Port William – taking on some of the responsibilities around home visits. Dr Charlie Dunnett is Clinical Lead for Wigtownshire and GP at Galloway Hills Medical Group, and he said: “This is a six-month pilot project where we are using the skills that paramedics have to help the practice with their house visiting. “The premise behind that is to determine whether or not it’s a good model of care, making use of paramedics’ skills in assessing people in their own home. “They’ll be working alongside and under the supervision of the general practitioners. When the house call request comes in, the GP will decide if that’s an appropriate house call for the paramedic. “If it is deemed to be suitable, then the paramedic will be despatched to go and make an assessment. They will then feed that back to the GP who will decide what further action is required – for example, what medication, if any, needs to be prescribed. “If it’s felt that a further GP visit is required, the GP will attend. “And if the paramedic feels that hospital admission is required, then the paramedic will admit the patient directly to hospital having discussed it first with the GP. Kenny McFadzean from the Scottish Ambulance Service is Head of Ambulance Services for Dumfries and Galloway. He said: “Our approach in Dumfries and Galloway has been to try and integrate as much as possible with NHS Dumfries and Galloway for the benefit of the patients we all serve. Ongoing assessment is taking place assessment around the value of the model and patient views and satisfaction. Previous articleD&g Charity Wonders If You Can Help The World Become A Kinder Place?